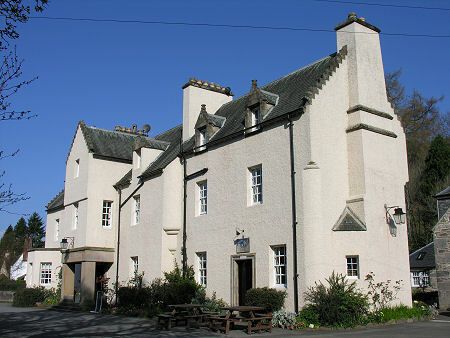 The Fortingall Hotel forms an essential element of the "Arts & Crafts" planned village of Fortingall in Perthshire. It stands in a prominent position overlooking the only road through the village and is close to Fortingall Church and to the Fortingall Yew, believed to be 5,000 years old and quite possibly the oldest living thing on earth. You can read our dining review for the Fortingall Hotel here. In the late 1800s the local laird, Sir Donald Currie, commissioned Arts & Crafts architect James MacLaren to build what was in effect an estate village. What emerged was Fortingall, one of the prettiest inland villages in Scotland, unusually including many houses with thatched roofs. There was already a hotel on the site of today's Fortingall Hotel, but MacLaren transformed it almost beyond recognition. The result is beautiful, with themes that would later be picked up by better known architects like Charles Rennie Mackintosh, but which still carried echoes of the traditional design of Scottish tower houses and castles. The hotel's public rooms reflect the character of the building itself, and have been further enhanced by the current owners decorating the walls and many of the surfaces throughout the hotel with an extensive and eclectic collection of artworks. 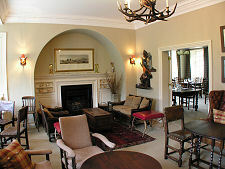 The public areas include the comfortable guest lounge with its open fire; the large dining room with its well spaced tables; the library, with its collection of maps and books; and the Ewe Bar, which lies at the east end of the hotel. This is best described as a comfortable pub with a stylish twist. There are ten en suite guest bedrooms at the Fortingall Hotel. They enjoy a variety of outlooks, either over the strath of the River Lyon to the front, onto the hillside behind, or if you have the Glenlyon Room, over the pretty village of Fortingall itself. The rooms are all named after local estates, and while a number of styling elements are carried throughout, each also has an individual character. 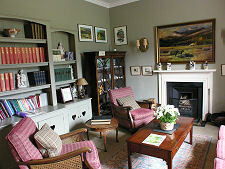 This is achieved by the use of the Tweed associated with the estate it is named after being used on elements such as the headboard and chair covers. Three of the rooms are classified as superior doubles, and six are classified as standard doubles. The tenth room is a twin, and adjoins one of the doubles, allowing the two to be used together as a family suite. The differences between the superior rooms and the standard rooms tends to be in terms of size rather than quality or comfort, and the bathrooms all tend to be sized generously. As befitting a hotel in a area in which outdoor activities are so important, drying facilities are available, as is secure storage for guns and cycles and a stock of Hunter wellingtons for guests to borrow. The Yew Room to the rear of the dining room offers a self contained function suite with its own access and toilets (including disabled access and toilet). This is an attractive and airy room capable of accommodating 20-30 depending on layout. As a result a range of functions including business meetings and weddings can be hosted: and for larger gatherings the hotel can be used in conjunction with the Fortingall Village Hall. The hotel has a wedding licence, though with the charming Fortingall Church being situated literally next door, a reception in the hotel often follows a wedding in the church. With 10 guest rooms, the hotel may also be let out on an exclusive use basis. Disabled access is provided at two points on the ground floor: to the rear of the Ewe Bar and next to the Yew Room function suite. There are two disabled toilets available, and the whole of the ground floor of the hotel is level. All guest rooms are on the first floor of the hotel, however, so are only accessibly by those able to tackle the stairs. Part country house hotel, part restaurant with rooms, part village inn, the Fortingall Hotel has something for everyone, backed up by high levels of comfort in the public areas and guest rooms and extremely stylish furnishings and decor which are entirely in keeping with the Arts & Crafts character of the building itself. Couple this with attentive and professional staff and very high standards of housekeeping, and this is a hotel which you will be keen to return to. 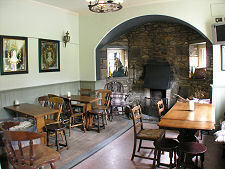 You can read our dining review for Fortingall Hotel here.